Jennie Jieun Lee loves to dance the Soca. “It’s a Caribbean booty-shaking class,” she laughs. “It helps me get out of my head.” We’re sitting inside her studio in the Brooklyn Navy Yard, in front of an audience of colorful clay busts. Faces have always been subjects that inspire the Korean-born, New York-based artist – she made her first ceramic piece, a small clay mask, at a pottery class in Lower Manhattan when she was four years old. The busts are a recent departure from the masks that Lee is known for, and have since been exhibited internationally, earning her the Artadia New York award in 2015. This summer, Jennie launched GLAZEMOODS, a line of ceramic functional wares, performed with the Stanley Love Performance Group, wrapped up an exhibition with artist and boyfriend Graham Collins at the Marlborough Chelsea Viewing Room, and is prepping for a six month-long residency at California State University in Los Angeles in September. Lee talks about surviving a period of creative paralysis and about her fascination with the future (she plans to bury a time capsule before she moves to L.A.). But at present, Jennie feels like dancing. She is out of her mind in the best possible way. The first time I ever did ceramics was when I was really little. My mom brought me to a pottery studio somewhere in Lower Manhattan and I had made a mask there. Later, I went to art school in Boston and started spending overnights in the ceramics department in the basement and I got so addicted to to doing ceramics that I would do overnights constantly there. I wouldn't go to class. I graduated in '99 and I didn't have access to a ceramics studio anymore so I stopped doing it entirely. In 2014, I was talking to my friend Jana and she said that she was a member at a ceramics studio in Greenpoint called Clayspace 1205. At the time I was just doing freelance and I had just moved out of assisting fashion designers and working in fashion archives and I wanted to get back to doing art. I started doing a work-study program at Clayspace 1205 and that's where I learned how to do almost everything that I do now in my own studio. Because it's a communal space there, I ran out of space, so I moved the studio to my house in Fort Greene. The studio was partly outside, so it would rain inside. I moved here almost a year ago. It's been amazing to be here and have my own space and for it not to rain and snow inside. [Laughs] I don't have to cover everything! My old studio was a sunroom, half of it was. There was a roof but there was a lot of cracks. It would snow in your studio? Yeah and when it got too cold I actually couldn’t live there. I thought, “I can’t do this anymore.” That’s when I found this place. I come here every day. I try not to answer my emails before I get here, but I do because I wake up to them. I’m trying to change that. When I get here, I work on whatever is pending. Usually in the last year it’s been gallery shows. Why do you try not to check your email? I’m having this problem with my neck. I can’t move it to the left or to the right anymore because it hurts so bad. I can move it today but yesterday I literally couldn’t move it. I’m not living ergonomically, so I have so much pain. Not even from throwing. I think it’s the way that I’m glazing, it’s the way that my body is, I don’t know! I glaze straight for like six hours without stopping because I get in this zone and I think doing that is wearing and tearing on my body. There are so many variables to error and so many things either mess up or crack in the kiln, I give myself like two months before each show to prepare – I try to, if I’m lucky to prepare and make everything just in case something explodes. And then I leave the studio and I usually go to dance class to get it out of my system. You mentioned that you started with a mask and now you are making busts. What interests you about faces? Yes, for me to get back into doing art, I just replicated what I made when I was little in that pottery class. And I just continued to do it because it felt right and it was easy. And then I started thinking about all of the things that I was suppressing during all those years of being blocked. There was a period of time where I didn’t leave the house and I had a lot phobias and I didn’t really have that many people to talk to. And the more I looked in the mirror the more grotesque I would become. Those faces stayed with me and it was a really good way to exercise them by making these masks in the beginning. I was so interested in the way that glazes react with one another and layerings and what I could do with chalks and under glaze pencils, it just kind of worked out together to marry the two – the techniques and having this idea of, “Why don’t I just get out everything that I saw in my mind that scared me?” And then it worked out. And I’ve made so many since then. There was so much that needed to come out because I couldn’t stop making them. And then my friend Eddie [Martinez] put them in a show and put them together on a wall. And that theme continued for two more shows in that kind of way – I would make more masks and they were presented in a group on a wall. How did you feel when you first saw them all together? I think it was the first time that I wasn’t ashamed of what I made. I spent many years a long time ago being fearful and ashamed of what came out unless I was intoxicated. But this was the first time that I was proud of what I made and I liked it, and I trusted his [Eddie’s] vision for the show. It was called “Bad Fog” and it was curated by Eddie Martinez at Martos Gallery in 2014. Do you think fear is important to making art? I can only speak for myself and I know that my whole life has been driven by fear. And for the most part it was extremely stifling and stopped me from doing anything that I wanted to do. It kept me inside and it kept me isolated. A few years ago, I was living a life that I did not like and I was very depressed from it, and I was able to turn that fear around and able to use it as the gasoline to fuel making stuff, so I would never go back to a place that I was for so long, which was stuck and scared and fearful of so many elements in life that felt uncontrollable to me. I was afraid of being stuck working. Hustling and working for a living to make such little money to almost get by. And to not have enough psychic energy to make my own stuff. I’d be so exhausted and drained at the end of the day that the thought of trying to make my own work was so daunting and then I would try to do it on the weekends, but I think I was just completely encompassed by this heavy blanket of reality. I was very hopeless. 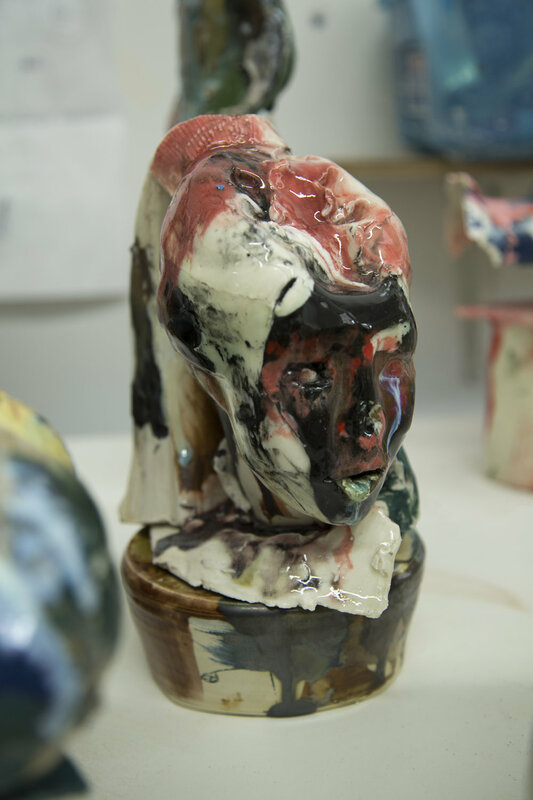 But as soon as I was able to get a taste of something else, which was to finally be making my own work and not judging it – I think ceramics is so good for that because half of the work is done in the kiln, so I feel like someone else is doing some of the work, like the fire is the other person. The fear has driven me. It’s what’s gotten me to make as much work as possible, so I don’t ever go back there. You had this period of your life when you weren’t making anything. Do you remember that first piece you made after that period? I might have thrown a bowl. It was between throwing a bowl on the wheel or a small mask. And then I made a box for Graham [Collins], my boyfriend, for him to put his pennies in and we still have it. It’s very small. I talk like it was so long ago because I’ve made so much stuff since then. But it was literally only three years ago. How did you feel while you were making it? I cried. I was so happy. And when I moved my studio from Clayspace to my house – the sunroom where I was alone – I cried often while making stuff because I couldn’t believe I was able to. It was almost like seeing your long lost relative or your mom, and you had been estranged from them. It was like that. I’d been wanting to do this for so many years and I was able to finally do it, and I would cry. And I was afraid. Another reason for fear was then I was afraid it was going to be ripped from me. So I obsessively made as many things as possible so I wouldn’t lose that momentum. That block was so intense. I guess it was needed but it feels like it was really harrowing. What if you were placed on this earth to do something and you couldn’t do it? It’s agonizing. I felt like I was finally doing what I wanted to be doing. It was really emotional. Was there anyone supporting you through that time? Graham. Oh yeah absolutely. When I met Graham, my boyfriend, he had worked in ceramics and he had a kiln in his house. I remember one day I was going to work and he got some clay and we made some time before work to work on stuff. And I remember being so happy about that. He’s been hugely instrumental in helping me get back to doing my work. How do you make a stoneware piece? The clay is stoneware. I use a very light off-white color. For example, let’s say that we’re making a mask, I’ll open the box – it comes in 25-pound bag squares – so I’ll cut them and then put them through the slab roller, and roll that wheel. And then that will be your canvas, it will be a flat piece. From there, I’ll scratch into and lately I’ve been adding colored porcelain, which you can make separately. Porcelain and stoneware are both types of clay that I fire to about 2200 degrees in the kiln. I could use porcelain or stoneware, it depends what my preference is. But if I’m making stuff and I’m worried about whether it’s going to crack a lot…although in my work a lot of it is about cracking. I always say from Peter Voulkus “life is in the cracks” and I really do enjoy the cracks. But if I didn’t want a piece to crack too much, I would use stoneware over porcelain because porcelain tends to crack more. But porcelain is much whiter. So then there’s different versions of porcelain. There’s frost, which is really translucent. It depends on what kind of look I’m going for. What kind of look to do you tend to be drawn to? It depends. The last masks I made were the show that just ended in Brussels at the gallery Levy Delval. There I put in about eleven masks and five or six busts. And for those masks I made in December, I don’t know if people can tell, but for me when I was making them there was definitely more of a solemn feeling. My best friend was dying of cancer and it was very difficult to motivate. While he was in hospice care I was making these masks. I think they came out more grim. I’m not sure if anyone would be able to tell because they’re still very bright. It’s okay. Thank you, though. Thanks. Some of these heads I was making, that were at Independent Art Fair with Martos, those were made while he was sick and dying. It depends on whatever is happening. That saying “Life is in the cracks” is very beautiful. Could you speak to that a little bit more? Peter Voulkos was a master in ceramics and he was Greek and he influenced so many people. He would have plates that looked like they were thrown and huge vessels that were very abstract and very expressive. Just incredible. I think in ceramics, or maybe in the general world, cracks are defects or looked upon as something ugly that shouldn’t be there or whatnot. A lot of people in ceramics try to make things as perfect as possible to sell at fairs and stuff like that. But there’s just no way that I could even attempt to be that kind of person. I think it would be impossible for me to make stuff that was pristine, that looked like it didn’t have fingerprints or wasn't messy or kicked or scratched. So instead of trying to be something that I’m not…people practice to be masters but I’d much rather keep working to be a master at what I know I am inherently, which is a mess. So his work definitely speaks to me so much. Someone once kindly paid me a compliment saying that I was like a “sensitive Voulkos” – Peter Voulkos. She might have even said “female” which is totally fine. I really liked that. I was reading the names of some your pieces, like Toothache or Nervous Change, and they seem to describe small traumas in daily life. Are they from your personal experience? My stuff is so highly self-centered, just completely from my own experience. A toothache is something that I suffer from every single day because I ate so much candy for like fifteen years. I ate a ton of sugar and it destroyed my teeth, and I also got into a few fights a long time ago and I’ve had a few of my teeth knocked out. So there’s been a lot of reconstructive or pulling-out of teeth. And then I grind my teeth a lot at night. Although I wear a mouth guard, I pull out my teeth because the grinding goes back and forth. So I have chronic tooth pain. I’ve gone to the dentist but I don’t know if there’s a cure for it because it’s either pull them out or get implants, which is really expensive and I can’t do that right now. It’s something that I live with daily. Nervous Change is about having change while walking, I have to put it away because it’s very irritating to me and it’s bumpy. I have a problem with change in my pockets, I have to put it away. Oh, it’s like coin change. I was thinking of the other meaning. Oh yeah, like change of seasons. Well, they say, “Change or die,” so I’m fully aware that if I don’t change I’m going to die in life. You have to adapt. Or I have to adapt because if I don’t adapt to things that are changing, I think I’m going to have a much harder time in life than I already do. You’ve talked openly about experiencing agoraphobia. What else were you afraid of? During that time, it was mostly agoraphobia. I spent a lot of time inside and I had a TV by my bed. I spent so much time in bed, in my twenties, that I was on my side and my TV was on it’s side as well, and I would change the television with my toes. You talk about not wanting to go back in the past and your work seems to be a way that’s helping you to move forward. Do you ever create something thinking about where you pieces will end up, in the future? All the time. I was actually talking to a friend recently and I was just saying how grateful I was that I was able to be doing art again and making the stuff that will be here so much longer than I will. And the thought of it, if somebody finds it, recently I’ve been looking and watching these mudlarkers, these people in England and other places, they go to the river and they find little shards of old pottery and then they put it together, and they try to identify the time it’s from, just like giving a voice to this to tiny little thing. And I thought it would be really cool if my stuff was broken and it was found in a river and different people could find it and put it together. And then I felt very honored to be working with a medium that will be here for so long and that if the people who find it and want to find it, that they can, and that they’d even be people who are interested in finding it. It’s kind of like the people who walk around with the metal detectors, and they find different things. Mudlarkers are like that except in the river. And those people that find the stuff with the metal detectors, I remember seeing them in the 80s when I was little, and I thought, “Oh that’s so cool. They find little things.” How great is it to find things? To search and actually find things, and to have to work for it. It’s poetic, in a way. Yeah. For some reason I feel better if I find something as opposed to when it’s shoved in my face or given to me. It might be problematic but finding and working hard and suffering equals good. There’s some type of release. But, yeah, I think about how my work will be found much later. I hope it will be broken much later on, somewhere in a dump or in a river, and people can put it together like a puzzle. What would you want them to think once they put it together? It would really depend on the person that found it. I could only think if I was to find it. I would be really excited. I’d by psyched and then it would give me something to think about. I’d be able to use my imagination to tell myself a story and maybe even a dialogue of what happened back then. I was going to recently like make a…what’s it called when you have a shoebox and you put a bunch of stuff in and you dig a hole in the backyard? Yeah, I was going to do a time capsule with my two other friends. Actually it was a year ago and we totally forgot. I started a text thread with them that was called “Regime” and it was to start this time capsule, and I just remember it now that I totally spaced on it. What will you put inside the time capsule? A bill from today, a ceramic, a letter to the future, pictures. When you’re working, what are you thinking about? That’s the thing, I’m not thinking. At all. That’s why I enjoy it because I’m not thinking. I have such a problem with thinking. I over-think everything. And when I’m making, I’m not thinking. © 2018 the vernacular. all images are copyrighted by their respective authors.